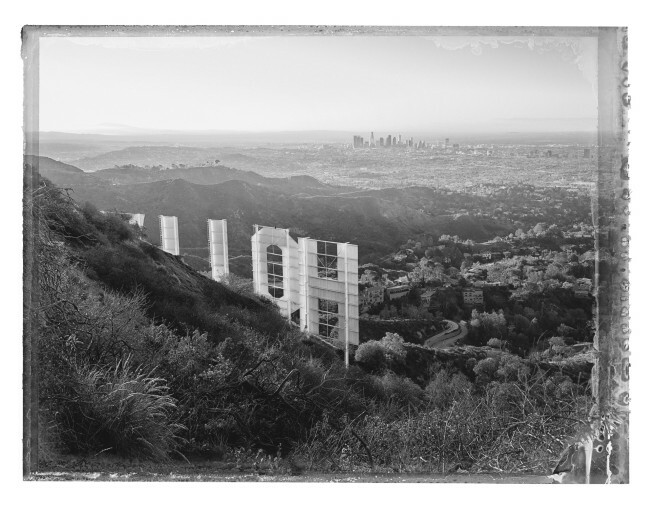 With these atmospheric black and white photographs, Thomas brings his unique style of city portraiture to Los Angeles, originally established in Münchner Elegien (2001–2005), New York Sleeps (2009), Venice in Solitude (2010)and Paris: City of Light (2014). As with his previous series, he transports the viewer to a silent city, devoid of human presence and cars, particularly extraordinary in a portrait of L.A. The exhibition includes classic views and motifs associated with the city, such as the Hollywood Sign, Randy’s Donuts, Sleeping Beauty Castle in Disneyland and Santa Monica Beach, as well as more unexpected pictures of oil pumps, solitary piers stretching into the Pacific Ocean and the nucleus and centre of Los Angeles under the Spaniards. 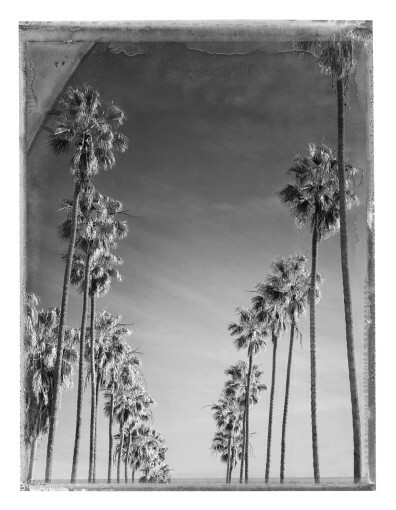 Prestel Publishers has released a new book, Christopher Thomas: Lost in L.A., with the full series of images and text by Ira Stehmann. Thomas has been travelling to L.A. for more than three decades, several times a year, with the knowledge that in the history of photography, no conceptual and comprehensive photographic survey of the Californian metropolis has ever been created. Thomas’s desire to capture the City of Angels in his own distinct style thus grew. 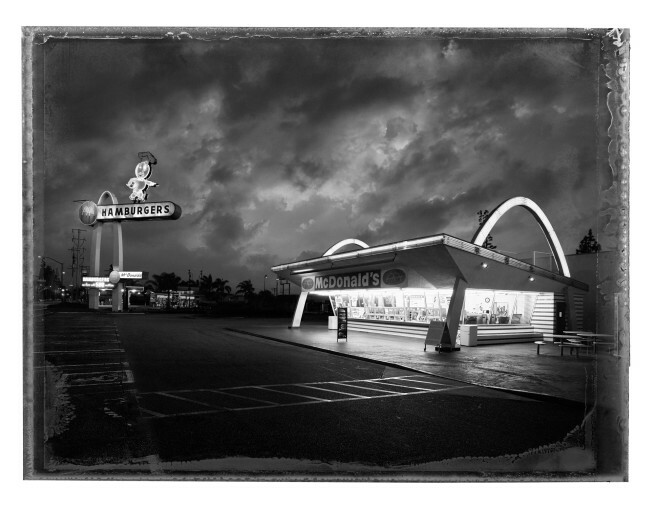 In 2014 Thomas set off to L.A. once more, with the project specifically in mind, to record the architectural highlights and famous ‘Googie’ icons (vernacular commercial architecture), as well as the lesser known buildings and areas, noting down where to stand, what details his images should include and the light conditions. He settled on capturing the scenes primarily in the early hours of the morning, just before dusk, or at night by moonlight. For his stay from January – March 2017, Thomas lived in a camper van in order to make his way carefully around the city. As a visitor to L.A., it could be possible to bypass the architectural diversity and creativity due to the vastness of the metropolitan area and the perpetual gridlock on the streets. This city portrait is not intended to be a comprehensive architectural account – much has not been taken into consideration, Rudolph Schindler to name just one – but it is Thomas’s personal view of the city’s cultural and architectural history that is reflected here. As seen in this exhibition, Thomas introduces the viewer to the Googie drive-in restaurants with their emblematic architecture. The aim of these buildings was to attract the attention of motorists, as seen in Norms, Randy’s Donuts, Pann’s and McDonalds. Reflecting the time the jet plane was invented, Thomas captures the futuristic Theme Building at LAX. He also sets his sights on major cultural edifices in downtown L.A. with Frank Gehry’s Walt Disney Concert Hall, like a stylised sailing ship with sandblasted steel sails. Christopher Thomas, born in 1961 in Munich, graduated from the Bavarian State Teaching Institute for Photography and has received a number of international awards as a commercial photographer. As an artist, Thomas has established a reputation above all through his city portraits and each series is accompanied by a publication. New York Sleeps, published by Prestel in 2009 (7th ed., 2016) was awarded the Deutscher Fotobuchpreis (German Photobook Prize). Thomas received several awards for this series Passion including the Silver Medal of the Art Directors Club of Germany (2011) and the German Design Award (2013). The Bayerische Nationalmuseum in Munich exhibited this series from October 2011 to April 2012. In 2016, the publication Female, dedicated to the aid organization WomenforWomen International, came out featuring burned and acid-attacked women. Works by Thomas can be seen around the world in well-known photography galleries and at trade fairs as well as in major private and institutional collections such as the Francois Pinault Collection, the Sir Elton John Photography Collection, and the German Bundestag Art Collection.